The Alcatel-Lucent 4039 phone is the receptionist or manager model in the 9 series digital range. It provides extra visibility for people that need to see more staff presence or just want a larger screen. For a full overview of the Alcatel 4039 phone please read below. The Alcatel-Lucent 4039 phone is the top of the range model in the Alcatel 9 series phone handsets designed to work with both the Alcatel Omni PCX as well as the Alcatel Omni PCX Compact pbx system. With its large display the 4039 handset is designed for receptionists or managers that need to see more a glance. The only things that distinguish the 4039 from the Alcatel 4029 phone is the larger display, 4 grey levels not just black and white, a higher resolution screen and the fact there are 10 soft keys - 5 on either side of the screen whereas the Alcatel 4029 has 6 in total. The rest of the rich feature set is the same. In terms of colour choice the Alcatel 4039 phone comes in both urban grey and arctic white. The 4039 phone handsets 10 soft keys allow users to see what's on screen. With a total of 40 programmable functions you can use them for staff, phone lines, personal speed dial numbers, paging and more. The way you access the other 30 buttons is by scrolling down the screen with the silver navigator button in the middle of the handset. 40 functions is quite a lot for current phone handsets however the reality for receptionists is its better to get a DSS console with more buttons for daily use. This is an extra module that is easily attached to the side of the 4039 phone and shows everything at a glance. You can add up to 3 extra Alcatel DSS 40 button modules (120 extra people) or 3 smart consoles with 14 buttons (42 in total). The 40 button use paper labels and are cheaper than the all digital smart modules. One of the most unique features of the Alcatel 4039 phone is the QWERTY keyboard you may have noticed at the base of the handset. It allows you the fastest access to your speed dial numbers of any brand. Simply type in the first letter, or first couple of letters, and it will bring up all the relevant stored speed dial numbers on the screen. Just find the person you're after and hit the OK button on the navigator. It dials instantaneously. You can also use the keyboard for internal messaging in the office. The keyboard and messaging may seem like a gimmick but customers that use it daily simply wouldn't live without it. The Alcatel Lucent 4039 phone navigation key (the silver round button) makes access to the systems other functions and menu straightforward, the large screen is easy to see. Another great feature is that the most popular buttons have been made different sizes and colours so they really stand out - it's very clever and something some manufacturers have copied. Red flashing message means you have a voicemail, yellow is to activate speakerphone, orange is to hang up a call etc... It not only works well, it looks great too. The Alcatel 4029 phone is cheaper and given the similarities in features, is by far the most popular phone in the Alcatel 9 series line up. In a typical rollout you would provide the reception with the 4039 phone, possibly the managers, but the bulk of staff would get the 4029 phone. For kitchens, retail shops, and staff that really only use to make/receive calls, the Alcatel 4019 phone is a very inexpensive option and a great addition to your Alcatel Omni PCX telephone system. For small business users one of the downsides is the Alcatel 9 series can be quite a departure from what they're used to. Avaya initially had this problem. Customers are used to seeing flashing lights next to phone lines/ staff keys. One of the drawbacks is the Alcatel 4039 phone is that the soft keys don't have LED's like other manufacturers phones do. This is harder to see the status of staff than glancing at a flashing light next to a name to see if someone is on a call or not. To this end receptionists should get the Alcatel 40 button DSS console with LED status. On one hand the Alcatel 4039 phone is a very good looking and intelligent handset but it lacks some of the simplicity that other phone handsets offer and that customers are used to. The 4039 handset is more like a large screen mobile phone that you can scroll down using the large navigator button on the console to view items and access features. It is important to note that you need to have at least one Alcatel 4039 phone with the Alcatel OMNI PCX phone system for programming purposes but that is all you really need. If you are looking at IP handsets then check out the equivalent Alcatel 4038 phone from the Alcatel 8 series IP range. 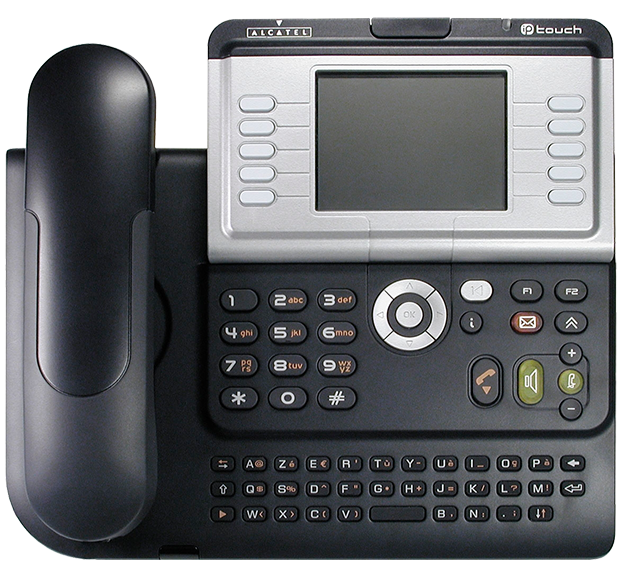 The 4038 phone is basically identical in terms of function however it has a 10/100MB internal switch for IP. There are numerous benefits to IP handsets but the initial cost is higher. The Alcatel 4039 phone comes with a 12-month Alcatel warranty as well as our exclusive free phone support for the life of your Alcatel Omni PCX phone system. Obviously thephone support offer is only available to Infiniti customers. If you'd like to know more about the Alcatel 4039 phone handset, or any of the other Alcatel models, please call our friendly experts for more information and free pricing. Looking to learn more about Alcatel Lucent 4039 Phone Handset (Reception)?